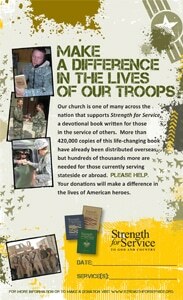 Thank you for your interest in supporting Strength for Service in your church. You are invited to join hundreds of other churches nationwide who have demonstrated their support of US troops through Strength for Service Sundays. 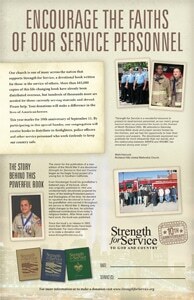 On a designated Sunday church members are given the opportunity to contribute to Strength for Service, a daily devotional book written specifically for those in service. On your Strength for Service Sunday, you might choose to talk briefly about the book and what an encouragement it is to so many men and women. You also could invite those with loved ones serving in the US and overseas to stand and be acknowledged, as well as say a prayer for our troops before collecting a special offering. Please contact us at 866-297-4312 if you would like us to send a book to your church to help emphasize its impact and raise awareness. 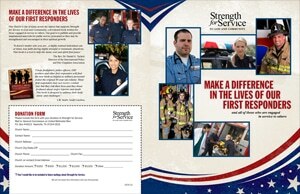 To help support Strength for Service | To God & Community, download the 11×17 informational letter & order form below. 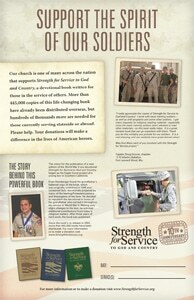 To help you host a Strength for Service | To God & Country Sunday, we have created posters for easy download to print and display in your church. On the posters is a box for you to fill in the dates and times you will be promoting the project. Posters are available in 11×17 and 8.5×11. Feel free to print off the insert below and include it in your church bulletin. Feel free to print and share with your church community this Brochure from the 22 Profit, a Medical Mission benefiting Veterans. Please also feel free to share this Brochure from Cal Heights United Methodist Church, on general ways you can help honor Veterans.